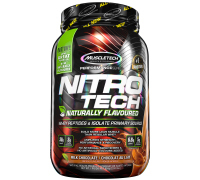 Introducing NITRO-TECH® NATURALLY FLAVOuRED. Not only is it a trustworthy tool for better workouts and superior results, but it is also an exceptionally clean protein athletes of all levels can feel good about. This innovative, naturally flavored formula is free of artificial sweeteners, flavors and colors. Like the original NITRO-TECH®, every scoop of this pure formula features everything you want to amplify strength and improve recovery: 30g of premium whey protein, 6.8g of BCAAs (including 3.3g of highly anabolic leucine), 3g of creatine monohydrate, and 5g of glutamine and precursor. NITRO-TECH®, the #1 Name in Performance Protein, is a superior, pure protein formula from MuscleTech®. 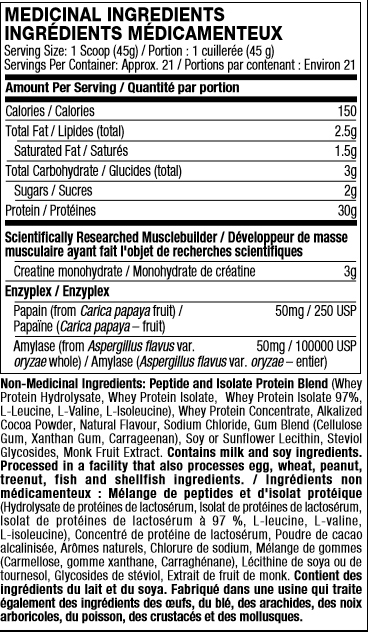 The high-quality protein comes primarily from whey peptides and isolates – two of the purest forms available. This powerful combination has 70% more creatine / protein than regular whey alone. That’s why athletes have been relying on this formula for over 20 years as their top choice for more muscle, more strength and better performance. Now, the same great formula is available in a new naturally flavored option with no artificial flavors and no artificial colors. Each scoop of NITRO-TECH® NATURALLY FLAVORED contains 30 grams of protein, primarily from whey protein peptides and whey isolate. These have several advantages over other forms of protein. NITRO-TECH® NATURALLY FLAVORED is carefully crafted by experts in one of the world’s top flavoring houses without the use of any artificial sweeteners or colors. Whether you drink it after your workout or use it to start your day, we’re confident you’ll love the superior flavor that NITRO-TECH NATURALLY FLAVORED delivers!